It's been no secret that we have been struggling with finding topics or courses to finish Amber's high school math credits. As with science, we have been forced to consider more creative solutions than the standard progression of math classes. Fortuitously, we were recently given the chance to review a unique set of online courses, MathArt Online 4-Class Bundle from NatureGlo's eScience. These courses mix various types of learning and activities to demonstrate how math is woven throughout our world. The classes are originally offered as live online lessons, which are recorded and available asynchronously as well. 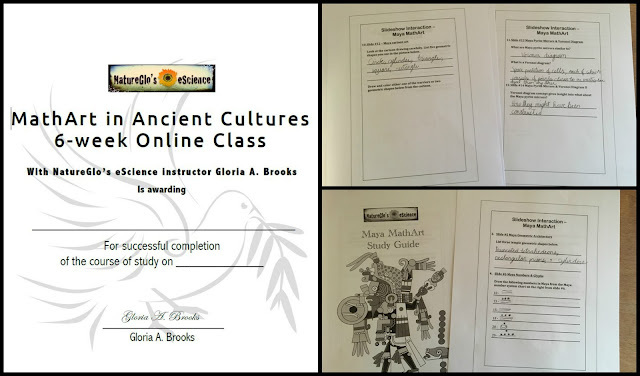 When we began the Math Connections with the Real World class was completed and available only as a recorded course, MathArt in Ancient Cultures was in process and finished during our review, while the final two classes began late in our review period. We chose to use the MathArt in Ancient Cultures, since this is the topic most likely to convince Amber to willingly work on math. The courses are all incredibly easy to navigate through each lesson. The right side of the screen contains an expandable menu that lets you see the individual portions of each lesson in the specific course. If the lesson has not yet been taught live, then there will be limited information available for the lesson. The user can click on any feature of each lesson to go directly to that activity, or can choose to progress in a linear fashion by starting with the first activity of the lesson and clicking the large green button at the bottom of the page for the next activity in the lesson. The page navigation also allows the student or teacher to mark when a specific activity / lesson are complete. This status is then shown on the sidebar menu by crossing through the activity name. Honestly, it is super easy to navigate this site and to know what your student has already finished. Just as the title indicates, the MathArt in Ancient Cultures contains lessons on six different ways math was integrated into the art of ancient cultures. Each of the six lessons is designed to take a week for the student to fully complete. The six topics are presented using a variety of activities, including a recording of a live presentation. There is usually a pre-lesson activity that utilizes a DK Find Out website displayed inline on the lesson page. 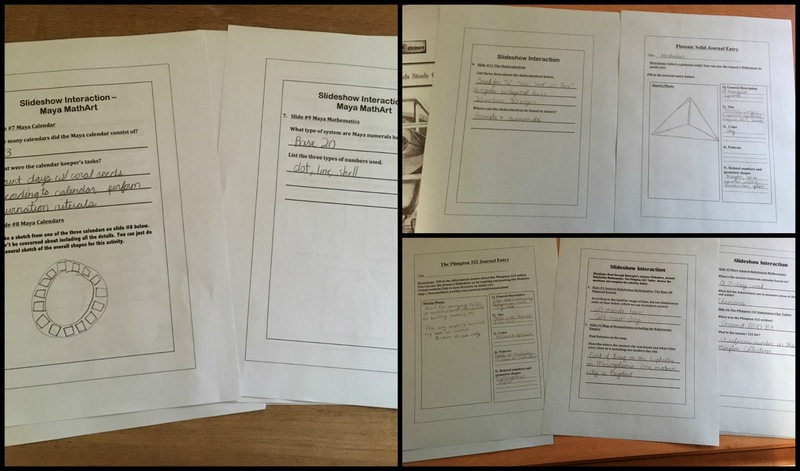 Pre-lesson and post-lesson interactive activities related to the lesson topic. Quite a few of these came from Mathigon for the MathArt in Ancient Cultures course. The main lesson videos, which include a link to download a study guide for the lesson and a link to download a slideshow that is used during the video. Inline on the page are the videos of the recorded lesson. You will be able to hear and see exactly what the students who participated in the live course did. You even get to hear their comments and the instructions they were given. The recording of the course goes over the same slideshow you can download, but often with more details provided by the instructor. Multiple activities linking the lesson topic to other disciplines, such has history and literature. These activities usually contain inline videos and links to other sites with additional information on the topic, and the pages provide the student with innumerable resources to follow where their interests may be. Other courses (but not the MathArt in Ancient Cultures) also include a Quizlet in the lessons. My initial reaction when considering these courses was a definite no. Amber does not do well with online learning. Still, I held off on declining the opportunity for some reason. Then something made me show the site to Amber, and of course her reaction was negative as well until she noticed the topics of the MathArt in Ancient Cultures course. All of these topics are something Amber would read on her own in her precious free time. To actually use this for school is a bonus in her mind. 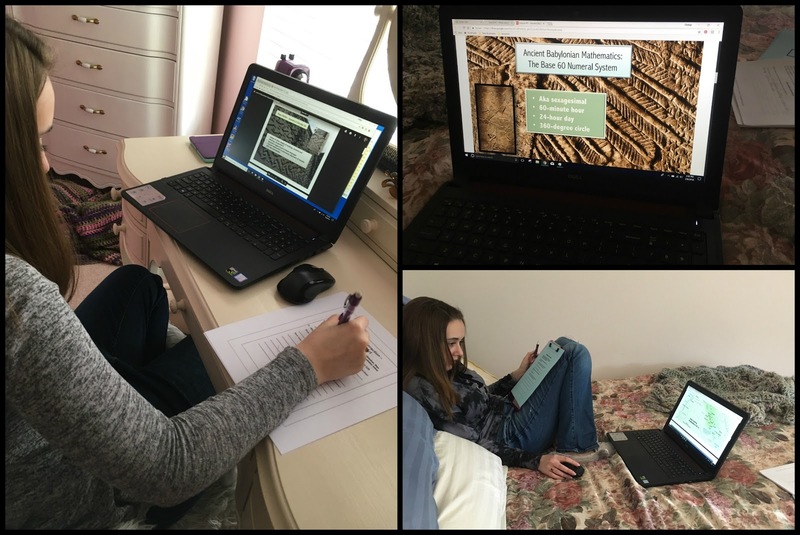 Given that we are considering allowing Amber to finish up her last high school math credit through an independent study of math topics, I decided these MathArt Online courses might be just the thing to test out our independent study plan. Although it requires quite a bit of documentation on my part, Amber was more than willing to give this a go, especially if it meant she could pause her current math course for a few weeks. Before starting with the MathArt Online class, I printed the study guide for each available lesson and then the remaining two lessons as they were posted. We were not using these courses live, but viewing the recorded sessions and using the resources provided. Right away Amber noticed the extra activities were a little simplistic for her tenth grade level, yet she continued on through them. We did not realize at first that the slide show is the basis for the video portion of the course, so on the first lesson Amber went entirely through the slide show and answered the questions in the study guide before watching the video. That left her basically watching someone present a slide show she had already seen in detail. Oddly enough, it worked out to our advantage that Amber used the slide show before watching the videos, since she had a hard time following the information when it was presented in the video. While the videos are designed to be the anchor of each lesson, Amber found them to be rather distracting. There were some technical glitches during the various live sessions that we had to listen and watch since these were recordings of those sessions. Amber also did not have the patience to watch a participation course where she was not part of the group. She did not enjoy waiting for the other students to answer questions, or the rabbit trails they went down during the lesson time. Some will not find this as difficult to handle as Amber did, but in the end I allowed her to skip the video recordings on the last 3 lessons and use the slide shows alone. Amber did enjoy going through the connections lessons selecting videos to watch and links to follow that related the current topic to literature and history. These connections lessons were the best part of the course for Amber. While slide shows helped to introduce her to the mathematical topic, she loved learning how that information was related to the history, art, and literature of these ancient cultures. Of course, the Mayan lesson was her absolute favorite and she followed as many of the links as possible to learn more about Mayan numbers and mathematics. If only she was quite so enamored of her own math lessons. Various pieces of the study guide. Many of the additional links and videos are definitely high school level in comprehension, and we documented the time spent on those for use in Amber's school credits. I still have not decided if they will go toward ancient history or her math independent study. Quite of a few of the pre-lesson activities and other items felt below high school level, and not something I would count toward Amber's school hours. We did decide to count the time spent on the slide show and study guide, even though those too felt a little easier than lessons we normally would use for high school credit. Some of the work in these courses can definitely be put toward high school credit hours, although they are not going to be a standalone credit. The amount of work and scope do not allow for that, yet they can be excellent supplements. There is a printable completion certificate for each course. And parts of the Mayan study guide. We still have not definitively decided how feasible a math independent study will be for Amber. Since we were so generously given access to the MathArt Online courses for a whole year, we might just try out another course or go through some of the connections materials on other topics to see how well that works for Amber. At any rate, we do appreciate the great wealth of mathematical information provided in these courses and the wide array of activities. 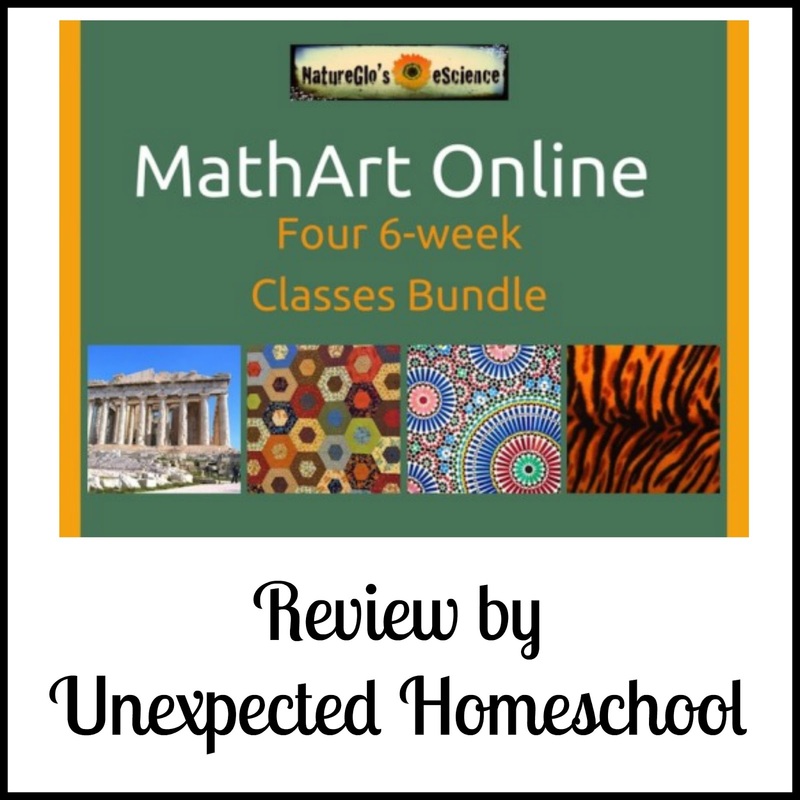 Other members of the Homeschool Review Crew also reviewed MathArt Online. Please follow the link in the graphic below to read their thoughts. Thanks for sharing. Our Dean also struggles no end with math. He would be happiest if he never had to use it again.